Another divine design by Heidi aka Nest Creative Keepsakes. This perfect topper will be your definitive summer go-to: Boxy with a tunisian lace trimmed bottom and sleeves ~great for dressing up or down. Heidi’s sample is worked in Kelbourne Woolens’ Mojave, a lovely cotton linen blend- just right for summer layering. 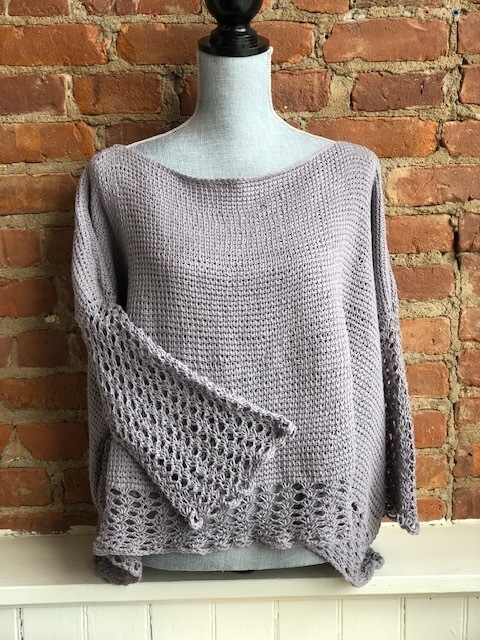 This class will take place over two sessions- in the first, you will design and learn how to construct the top; in the second class (Sunday, May 26) you will work the lace sleeves. It is also a quick and easy project worked in tunisian crochet- (basic crochet skills-chain and sc crochet required) so you will add to your skill set too!